Yellowstone National Park is filled with adventure! It’s 2,219,791 acres could keep you busy exploring your entire life. So how does one go about exploring Yellowstone? I say plan ahead! Yellowstone has approximately 466 miles of roads, 1000 miles of trails, 15 of those miles are boardwalks, 5 entrances, over 300 active geysers and almost 300 waterfalls. This is just the beginning of what there is to explore in this park! You need to know what you want to see before arriving because you will be one of over 4 million visitors that come here each year and without planning, you can find yourself spending most of your time driving and fighting traffic instead of enjoying everything Yellowstone has to offer. Here is my list of things to do Yellowstone National Park. What is the first thing you think of when you think of Yellowstone? For most, it’s Old Faithful erupting! It was the first Geyser named in Yellowstone and shoots water into the air at an average height of 130 feet for approximately 1.5 to 5 minutes at a time. This continues at intervals of 60 to 110 minutes. The Visitor Center at Old Faithful keeps track of the eruptions and have a 90% accuracy of predicting the next eruption within a 10-minute time frame so make the visitor center your first stop to make sure you are in place to see the eruption when it begins! 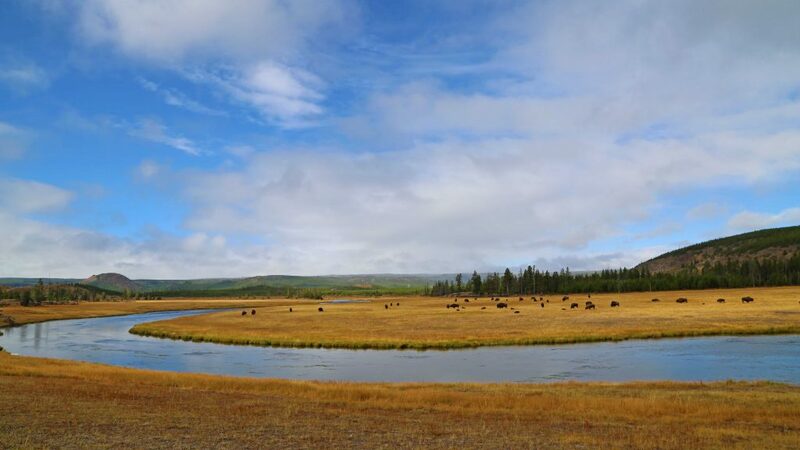 Seeing all the wildlife in Lamar & Hayden Valley is worth the trip to Yellowstone itself! It is here that you will expect to see photographers standing next to their tripods with massive gray color lenses waiting for that epic Yellowstone wildlife shot. It is by no accident that they have chosen one of these locations either. This is the place where Bison can be seen by the hundreds, red fox stealthy hunting in the tall meadow grass, antelope standing out in the distance ready to run at a moments notice, perhaps a moose or even a deer. For the truly lucky, seeing what was at one time extinct in the Yellowstone ecosystem, the Gray Wolf. Although they are still endangered, they have made a healthy comeback into this area giving some photographers a thrill of a lifetime capturing their movement and captivating stare. I personally love the Mammoth Hot Springs area of Yellowstone! The hot springs capture my attention every time and find myself compelled to hike amongst the boardwalks and just explore. 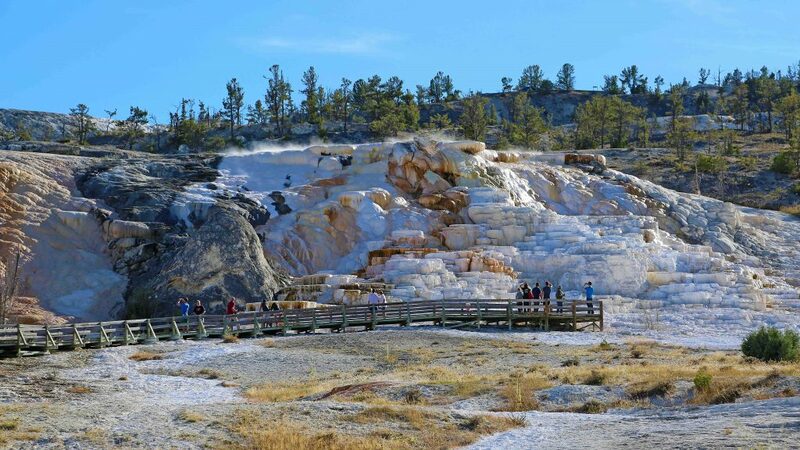 Don’t forget to take the Mammoth Terrace Drive! It seems to be one of those hidden gems. Mammoth Hot Springs is where the park’s headquarters are based and has some of the oldest buildings in Yellowstone. 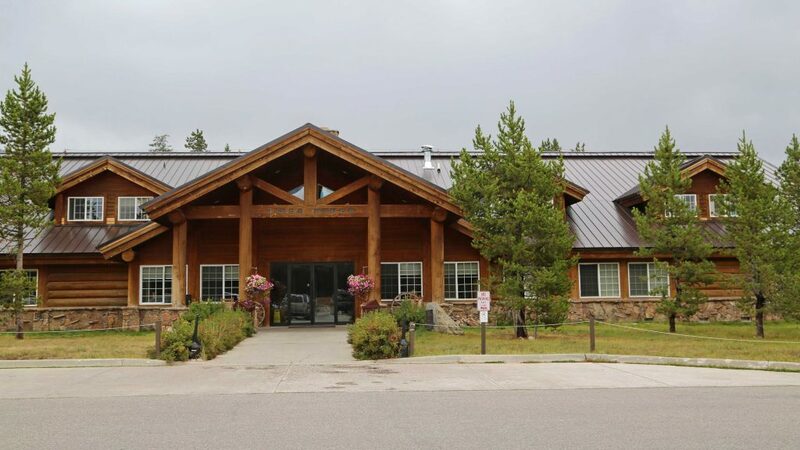 These buildings date back to the time when the U.S. Army managed Yellowstone as the National Park Service was not created until August 25, 1916. Make sure to keep a lookout for wildlife here as the elk and Bison love the lawn areas. 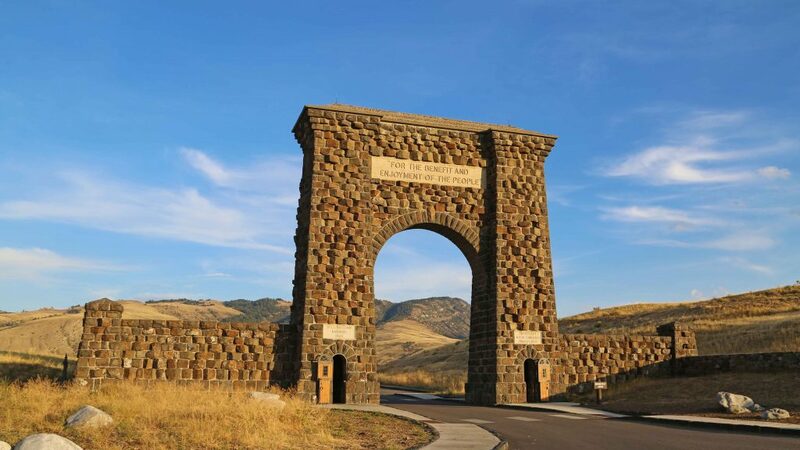 The north entrance to Yellowstone National Park was the first and only entrance to the park in the early years. Even today it is the only entrance to the park that is open year-round! President Theodore Roosevelt was a conservationist and parks supporter came to this location in 1903. He laid the cornerstone to what would become the Roosevelt Arch. This impressive Arch has inscribed “For the Benefit and the Enjoyment of the People” high above as you enter the park. These are the words that were said in the Congressional Act that declared Yellowstone a National Park in 1872. Everyone who has entered the park every since has had the pleasure to read these powerful words. This has no doubly changed American History forever becoming the first National Park in the world and has lead to 58 other U.S.National Parks and a total of 417 National Park Sites. The North & South Rim Drives take you to several lookouts allowing you to look into the twenty mile Grand Canyon of the Yellowstone. Here is where you will find Yellowstone Falls, a 308′ waterfall that is always a crowd pleaser. 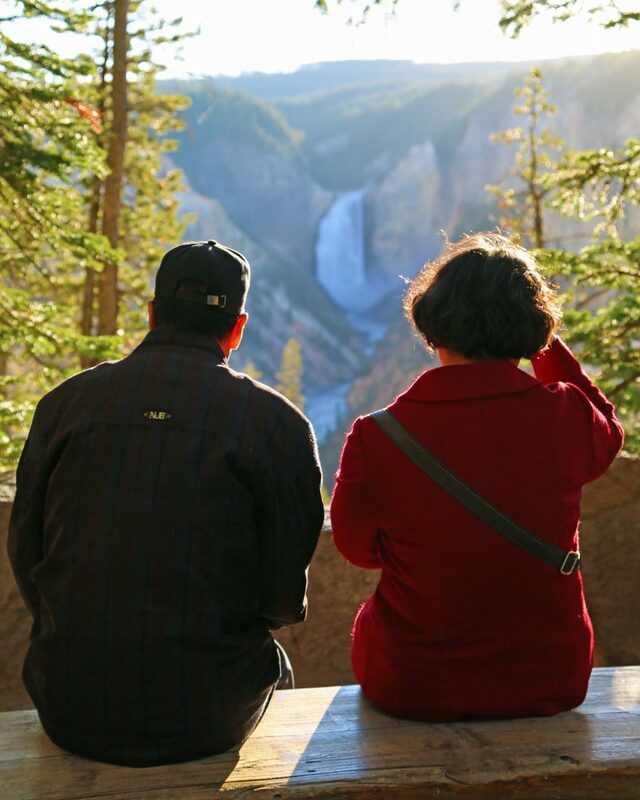 Lookout Point and Artist Point offer excellent views of the canyon and falls. There are also trails that will take you to the top of the waterfalls where you can actually feel the power of a waterfall. For the more adventurous, take the Uncle Tom’s Trail and it’s 300+ metal stairs and takes you into the canyon for a closer look at the falls. Park Ranger John Pro Tip: All too often I often see visitors in a rush to see everything. They are easy to spot as they have this hurried look on their face and a mental check mark going off as soon as they arrive at the destination. They rush for the perfect photo and are off again without enough time to catch their breath. Somehow they have forgotten what they came for in the first place. I loved this picture of a couple that just sat at this bench and just took in the moment. For most of us, we have traveled a great distance and saved up to get to this destination. Don’t get too focused on the check marks because what you and your family will remember is the moments you shared together not the quick photo you took from your iPhone. Yellowstone has close to a hundred trailheads and 1000 miles of trails to explore! There are miles of boardwalks taking you to some of the most popular features within the park so make sure to lace up your boots and come ready to hike. I am not going to try and cover this many trails with you in this article otherwise you would be reading a book. This was a special moment for me. My wife and I approached the museum and stepped onto the porch that looks out over the Gibbon River. I’m sure there have been many great Park Rangers who have done the exact same thing whether they were at work or like me coming to see the museum. I closed my eyes as I felt the sun shining down on my skin and just then I heard a noise, a noise that was very distinctive. It was the chatter call of a Bald Eagle. We began looking around and there it was flying in my direction coming from my right as it flew over the river making that distinctive call. Right then I knew that this was meant to be. 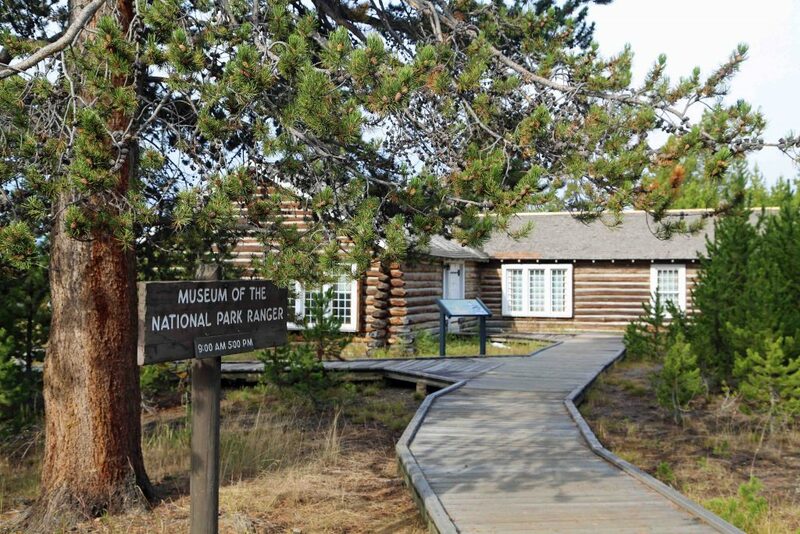 We began talking with a park volunteer who staffed the Museum of the National Park Ranger and found out that she herself was a retired Park Ranger. After enjoying great conversation and a few stories we explored the museum. I found this to be very interesting as it told the whole history of the Park Ranger from the beginning of the U.S. Army to today’s rangers who do numerous tasks to keep these parks running smoothly. If you ever have an interest in parks or being a Park Ranger then this is a must stop! There are some things in life that stick with you forever, permanently etched into our brains and instantly brings you to a happy place. For Me, starring at Grand Prismatic Spring is one of those moments! This is the largest hot spring in the United States and is the third largest in the world. 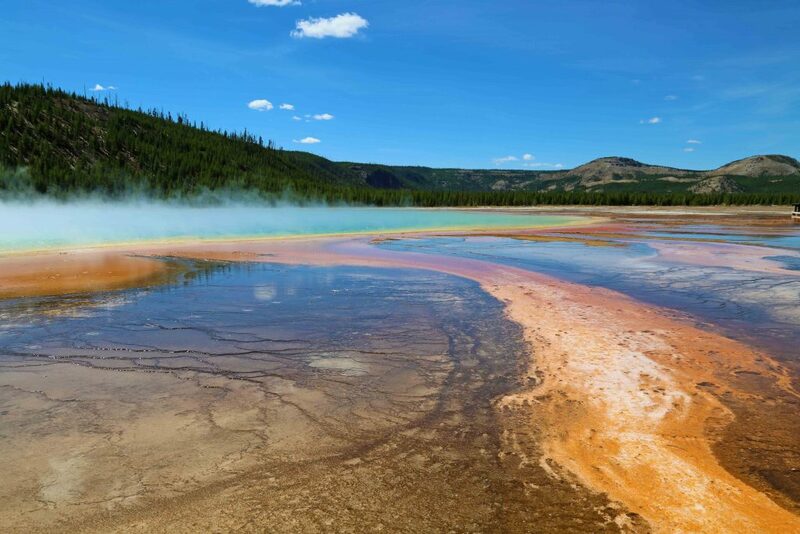 The color in Grand Prismatic Spring is a visual treat for the eyes. It’s no secret that photographers like myself go crazy shooting such a beautiful subject. The best part is that each day is different depending on the weather. There are lots of Geysers, hot springs, and mud pots throughout Yellowstone to keep you wanting to explore all of Yellowstone. Lake Yellowstone is the largest high elevation lake in America with over 130 square miles of surface water. Each year this massive lake freezes completely over! The water never gets very warm with an average temperature of 41 degrees Fahrenheit so swimming is not recommended as hypothermia sets in fast. Since swimming is not a great option, why not take a scenic boat tour. There is also guided fishing/sightseeing charter boats and rental boats available. Did you know that the highest population of wild Cutthroat Trout in North America lives in Lake Yellowstone? This has puzzled people for years as this is a Pacific Ocean fish and Lake Yellowstone drains towards the Atlantic. Scientists believe that at one time the lake dumped into the Pacific through the Snake River allowing the fish to swim across the Continental Divide. 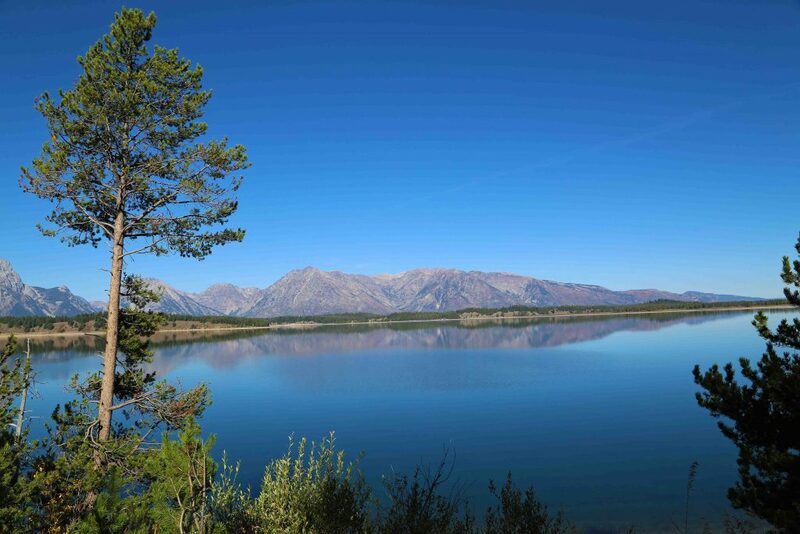 Visit the John D Rockerfeller Jr. Memorial Parkway and Grand Teton National Park! You can easily spend your entire vacation exploring Yellowstone National Park and not see everything. Having said that, it would be terrible to be so close to Grand Teton National Park and the John D. Rockerfeller Jr. Memorial Parkway and not see them too. Be prepared as it will be a long day of driving to/from Yellowstone but the trip will be worth it! I personally have a piece of my heart reserved for this area. The Teton Range is beyond spectacular as they explode from the ground straight into the air. Wildlife here is just as spectacular as Yellowstone and the fall colors are just jaw-dropping! The Headwaters lodge has one of the best hamburgers I have ever tasted, the Brinner Burger. All I can say is that everything tastes better with huckleberries. I hope this article serves as a great start for planning a trip to Yellowstone. Believe me, there is so much more to see and do! I could sit down and write a book on this subject and still not cover everything. 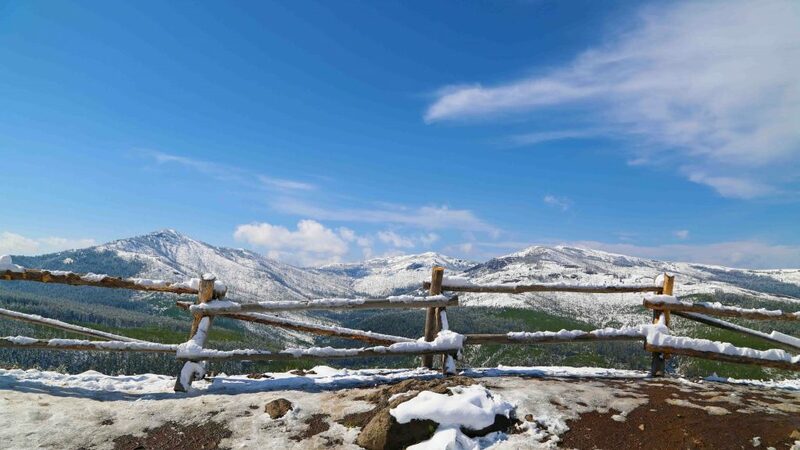 Remember that winter brings a whole new range of outdoor activities and things to do and it’s a dream destination for fly fishermen with endless possibilities plus so much more. I am confident that you can have the most epic vacation in Yellowstone with whatever you decide to do, just make sure to do a little planning first. Check out all of our posts on Yellowstone to help you plan an epic National Park Vacation! I would add that my most favorite thing I’ve ever done at Yellowstone was go have a sit at the boiling river. Its in between mammoth hotsprings and the north Roosevelt gate. Well worth the short hike on the path to go enjoy some of the hot springs that Yellowstone has to offer in a safe manner! Also real nice and relaxing at the end of a long day hiking around the park. I have seen people doing this, just haven’t tried myself. Now I have a new thing to do when we go back to Yellowstone. My Yellowstone advice would be to take advantage of the Ranger talks & walks. They make everything much more interesting for all ages. The National Park Service website is pretty good about posting the regularly scheduled talks/walks each season. The other place to find them are the Visitor Centers. We particularly enjoyed a 2 hour ranger talk/walk through the geyser basin. 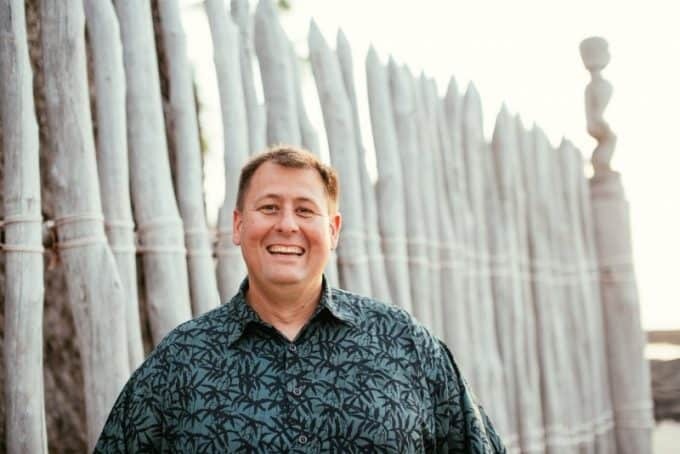 Thank you for the great advice & am thrilled you enjoy the blog! I love seeing the comments and ideas come in. Yellowstone is huge and there is more to do that what you could possibly put into any one vacation.